This time it's my mom I'm trying to please. She's been on her own quest for the perfect granola bar—crunchy and chewy, but low in fat. After at least 4 different recipes, she still couldn't find one she liked, so I thought I'd try my hand at the old granola bar game...again. She dictated to me what she wanted in the bars (cocoa, chocolate chips, wheat bran...) and I decided a no bake version might be worthy trying, since all our previous failures have been with baked granola bars. I couldn't eat a full granola bar, because of the sugar in the chocolate chips, but I tasted a small bit of just the goo and granola—yum. Mom loves them, and so did Dad (I couldn't believe it...after all those granola bars...). I only made them this morning and they are half gone already. 1. Preheat oven to 350F. On a cookie sheet lined with parchment paper, toast your almonds and oats, separately, until golden. Allow to cool. 2. Soak your dates until soft. Drain and reserve the water. 3. In a food processer, combine dates with honey, oil, vanilla, cocoa, salt and spices. Process until smooth, adding date water to achieve smooth consistency, if necessary. 4. In a separate bowl, combine almonds, oats, wheat bran, raisins and chocolate chips. *We froze ours at first, then put them in fridge to keep them firm. Oh!! These look the best by far, they hold their shape so well! I love the taste of dates. These sound terrific with the dates. 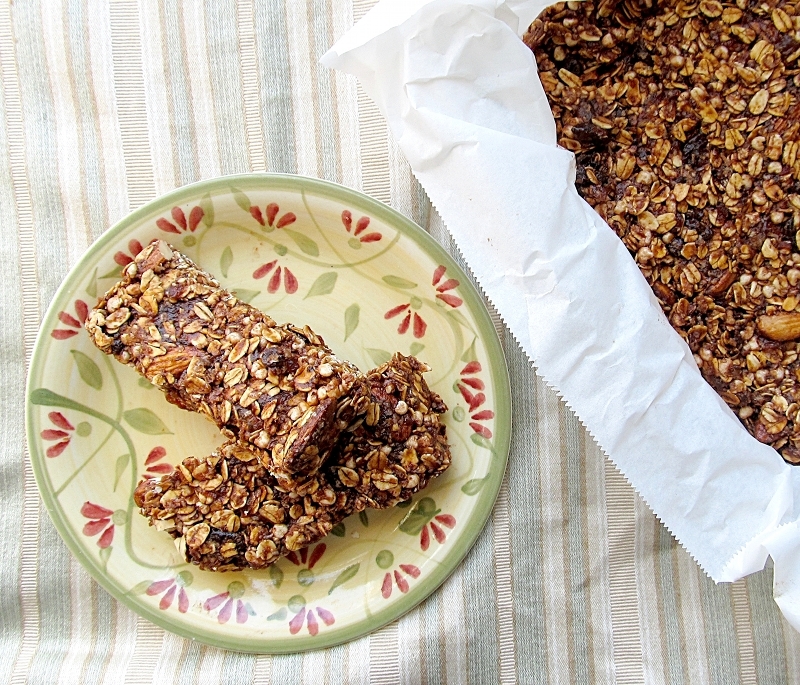 And it's almost back to school, time to make a few batches of no-bake granola bars.